2005-2008 Chrysler Dodge Jeep auxiliary audio input,for vehicle with the new style can-bus radio this interface converts the DVD RSE port of the can buss radio and allows you to input audio, it also allows you to keep the factory Sirius radio. Connects to factory 10 & 22 pin connectors at headunit. Compatible with factory satellite installed. Not compatible with factory "rear DVD system. Not compatible if vehicle is equipped with REF radios. Compatible with RAQ RAK REC Dodge Chrysler radios only. 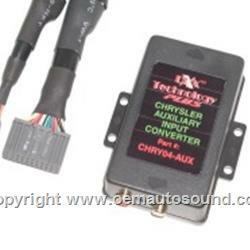 the Chry04-aux allows you to maintain the Oem sirius satellite radio.